…So you can see why I am totally digging cake mix cookies, right? They are so easy to make, and every time I have made them the cookies are perfectly soft, chewy and full of flavor! They have yet to disappoint, unlike some other recipes I have tried lately. Even though it’s supposed to be almost 90 degrees again tomorrow here in NJ, I am in full on fall recipe mode. I spent last weekend baking pumpkin and apple cake mix cookies (as well as a sweet treat for this month’s Spiked Recipe Challenge – Seasonal Beers) and I spend a ridiculous amount of time pinning pumpkin related everything to my Fall Pinterest board. I can’t wait for crisp weather, crunchy leaves and cozy fires in the fireplace. 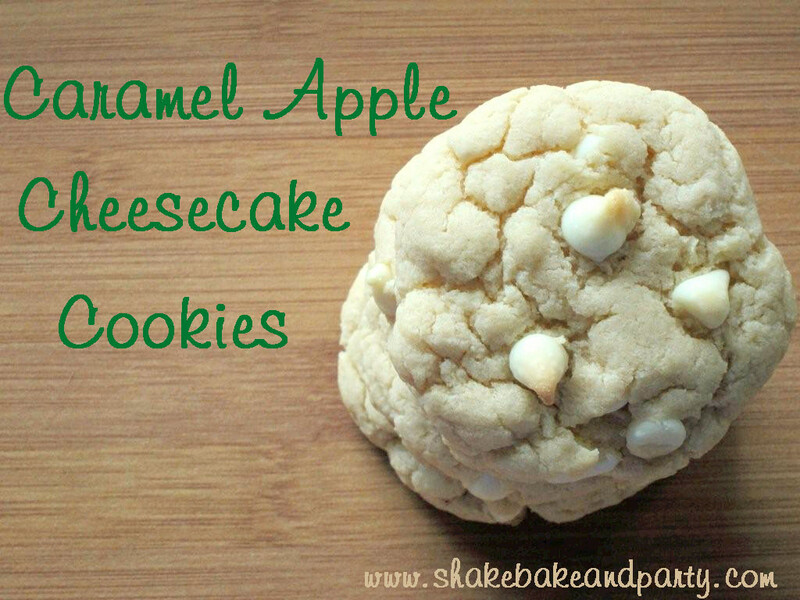 To help usher in my favorite season, I would like to introduce you to my Caramel Apple Cheesecake Cookies! As I mentioned, these are cake mix cookies and I used another one of the new seasonal Pillsbury cake mixes I found at the grocery store a few weeks ago. Let me tell you, this cake mix smells heavenly. I mean, it’s got caramel in it – how could it not? I used white chocolate chips in this recipe, but regular chocolate chips would be also be a delicious add-in. I’ve ogled those chocolate dipped caramel apples on numerous occasions, haven’t you? Same simple concept as the Pumpkin Toffee Cheesecake Cookies. Cake mix, pudding mix, oil, eggs = YUMMY COOKIES! 1. Preheat oven to 350. Line two cookie sheets with parchment paper. 2. Combine cake mix, pudding mix, oil and eggs in a medium bowl until a dough forms. Mix in 1/2 cup of the white chocolate chips. 3. Form dough into balls and place 2 inches apart on cookie sheets. 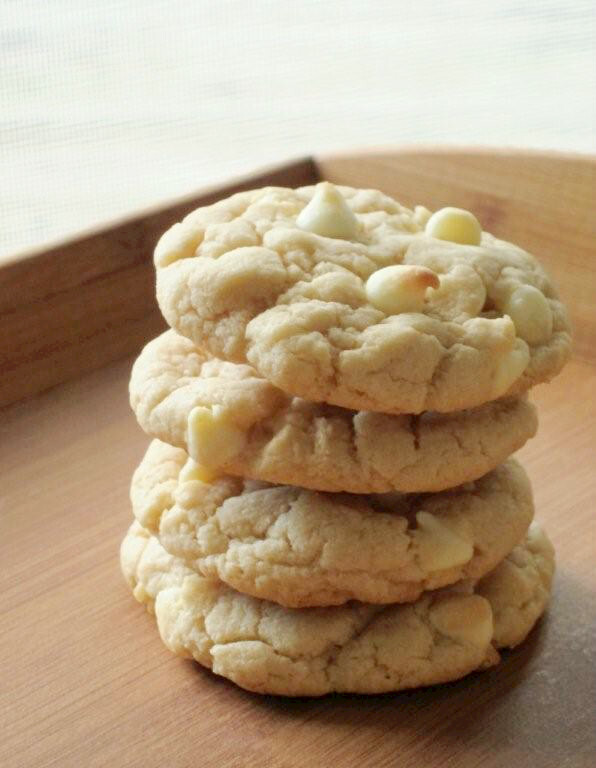 Use the remaining white chocolate chips to press into the top of each cookie. 4. Bake for 8 to 10 minutes, or until cookies begin to brown slightly. Remove from oven, cool for 2 minutes and then move to a wire rack. Thanks Tamara – they are beyond easy! You should definitely give them a try! Ooooh! The carrot cake/cheese cake combo sounds awesome Marla! I never would have even thought about carrot cake mix! Thanks so much for your comment! Yes, YES, YEEEEEEES! Caramel, apple, cheesecake = triple ultimate cookie win. 😀 Love these, Angela! The Triple Crown of Cookies huh? That’s a big compliment! LOL! Thanks Jess! 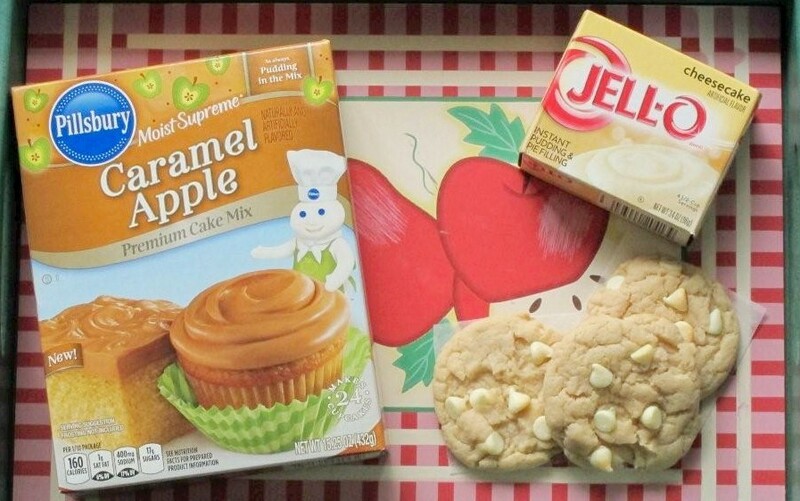 Do you think these would turn out the same using the carmel apple cookie mix instead of the cake mix?? Thanks for the recipe! The only cake mix cookies I have ever made were chocolate crinkles. I will have to try these. I love caramel apples!!! In cookie form would be doubly awesome! I wonder what they would taste like with pistachio pudding mix instead of cheesecake. I think it would be fun to have green cookies for halloween that taste like caramel apples, don’t you? Hi Amanda! Green cookies for Halloween would definitely be awesome! If you are worried about the flavor using the pistachio pudding you could always just add a bit of green food coloring to the dough when you are mixing it, but I say go for it! Thanks for stopping by! How fun and easy are those??!! I love it!! I am going to have to try these out with my kids. Thanks for sharing!! It’s such a simple recipe! Perfect for little kitchen helpers! : ) Thanks for stopping by Shari! I saw that cake mix this morning! I’ll have to pick some up. My name is Katie and I host Fall Into the Holidays, open Saturdays! I’d love to have you link up! Hi Katie! The cake mix is so good and it makes your house smell wonderful when it’s baking! Just stopped by, linked up and followed your blog! Thanks! The spice cake mix sounds like a great substitute! I love how easy the cake mix cookies are – I had never made them until a few months ago and now that’s all I’ve been making! Thank you so much for the feedback! I can only find the caramel apple cookie mix. Would that work instead of the cake mix? Hi Kristina! I think it would work. I would just follow the directions on the box of cookie mix, adding in the pudding powder and white chocolate chips. Let me know how they turn out! They turned out great! Had a greater caramel apple flavor. I could not find the caramel apple cake mix so used a lemon cake mix instead……RAVE reviews! That’s what I love about cake mix cookies – there are so many possible combinations of flavors and they are all delicious!! Thanks for stopping by Linda! Do I make the pudding mix and then add it to cake mix and other stuff? Or just add the pudding mix powder to the cake mix? Just add the pudding mix powder to the cake mix! I cannot find the cake mix? where is it sold?